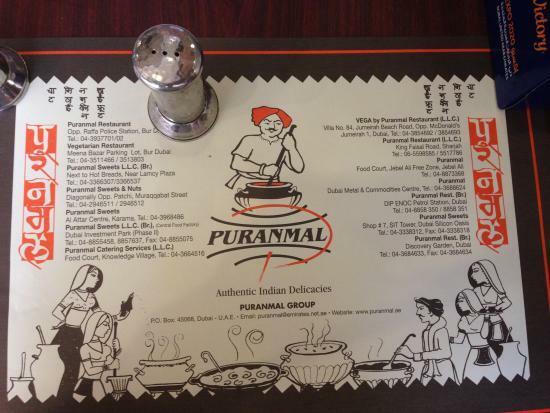 There aren't enough food, service, value or atmosphere ratings for Puranmal Restaurant, United Arab Emirates yet. Be one of the first to write a review! One of the most loved veg restaurants in UAE. Be it lunch, dinner or a quick grub, this is the place to be...just love the chole bhaturey out here. Felt better for north indian dishes and south indian looked a bit away from real. quick service and best located. It is more of fast food outlet. Excellent & home made like cuisine are served here. Little expensive, but serves quality food. It gives you a real feel of an authentic Indian veg dishes the way it has to be...nicely prepared, balanced taste, price is not a hole in pocket and within reach place in Sharjah for true indian food lovers. Its really a place full of Indian delicacies for food lovers...all the items are properly cooked, nicely garnished and presented...prices are also ok..not much costly..worth trying once !!!! Get quick answers from Puranmal Restaurant staff and past visitors.